Experience the stunning looks and power packed performance of all the new 500 watts nakshatra mixer grinder . Compactly built and elegantly designed , this mixer grinder occupies less space but attracts more attention . The power and durability of this mixer grinder takes on any kind of grinding with absolute ease . 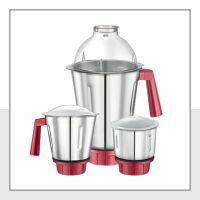 it comes with 3 stainless steel jars that cater to grinding needs. Take home a nakshatra Mixer grinder, the star of your kitchen. To Recieve updates and possible rewards for Prestige Nakshatra please sign in. To Recieve updates and possible rewards for Juicer Mixer Grinder (JMG) please sign in.